I've talked to him on the phone and he's a pleasant guy. I've also read Saving the Pitcher and think it's a well-timed and well-intentioned book, if fatally flawed, book. (Mark) Prior went on to have a nice year in '03, but a fluke injury took him down. Listen, I understand the position that Will is in. Saving the Pitcher is an attempt to address the problem of pitching injuries by combining the best ideas of Tom House and Dr. Mike Marshall. At the core of the book are Mark Prior's pitching mechanics and an explanation of why they are the model toward which all other pitchers should strive. Because he is so tightly wed to Tom House, it's extremely hard for Will to say anything negative about Tom House or Mark Prior, because doing so would invalidate pretty much everything that is said in Saving the Pitcher, turning a year's work into at best an exercise in futility and a massive waste of time. As a result, it's much easier for Will to go along with the party line that Mark Prior's pitching mechanics were perfect and his career was derailed by his collision on the basepaths with Marcus Giles. The reason I find the Mark Prior fluke injury narrative so infuriating is that it completely ignores another USC product named Anthony Reyes whose career at USC overlapped Prior's and whose pitching mechanics were virtually identical to those of Mark Prior. If you compare the pitching mechanics of Anthony Reyes and Mark Prior, you will see the same Inverted W arm action and the same timing problem. As it turned out, Anthony Reyes lasted only slightly longer than Mark Prior, likely due in part to the fact that he wasn't ridden as hard as Mark Prior was.1 However, in 2009 Anthony Reyes suffered nearly simultaneous shoulder and elbow injuries and hasn't pitched in the major leagues since. So why do I get so worked up by this? 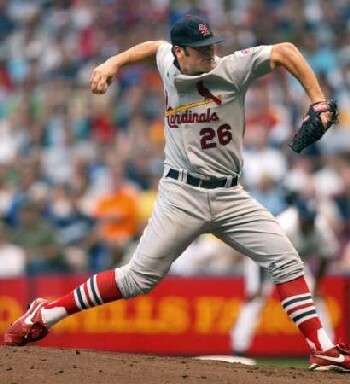 As long as people like Will Carroll and other Tom House apologists keep pushing the narrative that there was nothing wrong with Mark Prior's pitching mechanics, that Mark Prior was just a victim of a fluke collision on the basepaths, and continue to ignore the science behind the Inverted W, coaches and parents will continue to regard as valid, and teach, the pitching mechanics that ruined the arms of Mark Prior, Anthony Reyes, and the countless young pitchers who decided to copy Mark Prior's (supposedly) perfect pitching mechanics. I know it's hard for people to admit that they were wrong, but young pitchers deserve better. Dusty Baker wasn't the sole reason that Mark Prior broke down, but he certainly didn't do him any favors. You have to handle guys with problematic pitching mechanics very carefully.